Can character scavenge in this station area? Does character have minimum required stamina and focus? Character attempts to scavenge for an item. Store a “find” game event. As mentioned earlier, the order in which we declare steps matters. By default, if a single step fails, then all later steps are skipped. We need more flexibility which is where behaviors come in. ASSERT – If this step fails, do not call any other steps for any reason. ALWAYS – Always run this step (unless an ASSERT was previously failed). FAILURE – Run this step if any earlier step failed (unless an ASSERT was previously failed). Abort if the character cannot scavenge in this station area. Abort if character doesn’t have minimum required stamina and focus. 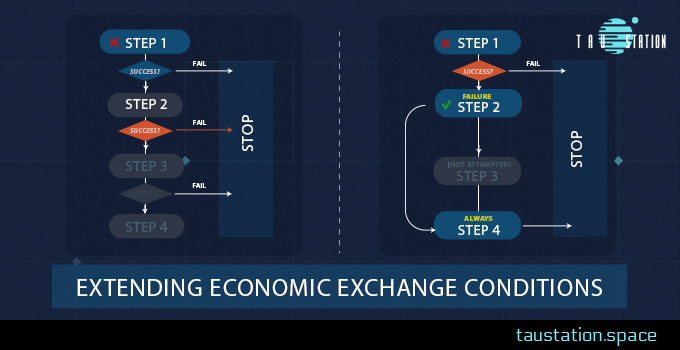 Behaviors allows us to refine the logic within economic exchanges whilst keeping them readable and concise. Behaviors also show why ordering matters and how we can use it to our advantage.